Like fine wine and good company, good food and a day at the spa go hand in hand. Picture this: you spend the morning being massaged and pampered, and after a soak in the hot tub or a cleansing session in the sauna, you pad down to the dining room in your spa robe and sandals for a delicious meal. “You can do great things on the body and do great treatments, but if you’re not getting the nutrients and the inside working with the outside. . . that’s when the magic really happens,” says spa industry consultant Vivienne O’Keefe. “You’re nourishing your body and you’re taking care of yourself,” says Paulina Alexander, director of Grotto Spa at Tigh-Na-Mara. The Parksville, B.C. spa added an in-house restaurant, Treetop Tapas and Grill, two years after it opened in 2003. The process wasn’t easy, she says, but well worth the effort. “By including dining in the spa experience, it really allows our guests to check in and enjoy our facilities as a full day experience,” says Alexander. O’Keefe agrees that adding a dining option to spa services enhances the experience a spa provides to clients. “Customers love it,” says O’Keefe. “It brings a deeper level of authenticity to the [spa] programming,” she says. Having a dining option has the potential to raise a spa’s reputation and increase its intake of clients, says O’Keefe, but it’s certainly not without its challenges. Located on the third floor, Grotto Spa’s Treetop Tapas and Grill features an intimate dining area that seats 30 guests at a time and floor-to-ceiling windows overlooking the treetops of the surrounding forest. The menu consists of tapas, appetizers traditionally part of Spanish cuisine. One of the Grill’s most frequently requested dining options is the chef’s presentation, which allows guests to sample everything at once, says Alexander. “Instead of choosing one entrée or having two smaller entrées, they can try everything on the menu,” she adds. 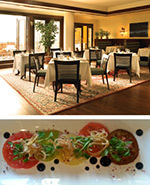 Elmwood Spa in Toronto, Ontario, offers guests a variety of dining options. The Terrace Restaurant, located on the fourth floor of the spa, has a balcony that opens in the summer and seats 18. Another part of the restaurant, called the Greenhouse, looks out over the city. Elmwood Spa shares an owner with Bangkok Garden Thai Restaurant, which has its own entrance on the main floor of the building. There is also a juice bar on the second floor of the spa that offers freshly squeezed juice. “Not only are people coming for relaxation in the spa, they’re also looking for nourishment and continuing that treatment of being taken care of,” says Britwin Dias, senior manager of food and beverage at Elmwood Spa and Bangkok Garden Thai Restaurant. Like Grotto Spa, Elmwood’s Terrace Restaurant offers a mix of healthy and indulgent food options, as well as a selection of Ontario wines, beers and martinis. “Our guests want quality food but they also want to indulge to a certain extent,” Dias says. Case in point, their most popular dishes from year to year are the steak frites and their rich chocolate desserts. They have also added more vegan, vegetarian and gluten-free options according to the changing demands of their guests. The first step a spa must take if they are planning to prepare the food onsite is to obtain a food license. If not, they must engage a reputable outside contractor. Either way, such factors as dietary preferences, food allergies and, most importantly, food safety must be taken into account. “We have a huge responsibility to make sure that [spa guests] are taken care of and we have the highest standard of care,” says O’Keefe. She stresses the importance of working through a food safety training program, such as Food Safe in B.C., to educate staff about the proper way to handle food. Serving food won’t necessarily increase profits for spas, says O’Keefe. Spas often don’t get good deals from outside food providers because they don’t take in as much volume as a full-sized restaurant. As well, adding a dining option to the services you provide means hiring a lot of extra staff to run such a program. Larger spas that are part of a resort or a similar operation will have an easier time. Still, day spas can reap the benefits of serving food, she says, as long as they are careful in their planning and mindful of keeping the operation simple, sustainable and safe. The key, she says, is to have a well-thought out concept for the type of dining service you want to offer and then be consistent about it. “Don’t make it too big, don’t make it too complicated,” says O’Keefe. Balsamic Reduction Put balsamic vinegar in a pot and reduce on medium heat by 3/4 with 1 clove and 1 bay leaf. Leave to cool and place in a squeeze bottle (or just use a spoon) for service. Remove the skin from a couple shallots (preferably “chicken leg” shallots. Thinly slice to produce “rounds” on a mandolin at 3-4mm width. “Break-up” the slices to produce rounds in a mixing bowl. Dust the shallot slices with 1tbsp cornstarch and 1tbsp rice flour. Shake excess “flours” off and deep fry (300*) in batches until lightly golden and crispy and then season with kosher salt immediately out of the oil. Place approximately 5 assorted slices of tomato in a line on a plate. Sprinkle with the salt and pepper. Place the sprouts and shallots on the tomato. Drizzle with the walnut oil and balsamic reduction. Blanch desired amount of prawns in a rolling boil with salt & pepper, lemon & lime juice. And chill. Avocado Mint Yogurt Fold together sugar, avocado, mint jelly, 2 cups of yogurt and chopped mint. Assembly Spoon in the two yogurts in a martini glass, place a small amount of arugula lettuce, then add approx 4 prawns, then drizzle a small amount of olive oil and fresh lemon juice over the prawns and top with dried chilies. Serve!